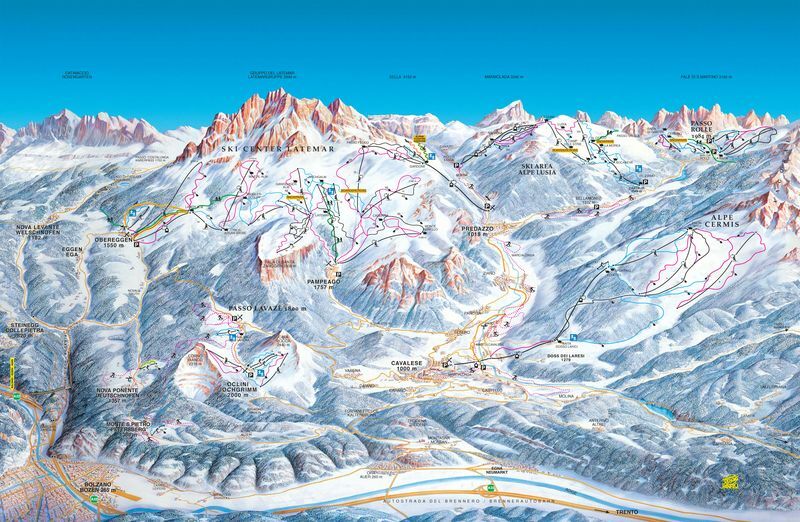 Obereggen ski resort is a part of the biggest ski resort in the world - Dolomiti Superski. It not only gives you the absolutely best place for ski holidays for all your family, but also delight you with beautiful panoramic views and interesting culture. Says it is one of the few resorts with high number of days of sunshine to enjoy you perfect ski holidays fully. It all started in the sixties, when Obereggen inhabitants decided to build the first lift facilities for locals and guests to enjoy the beautiful region while skiing. The tourism then was introduced and Obereggen, located 1550m above sea level, became a popular ski resort. Obereggen is a beautiful Italian ski resort with a splendid location. Due to the rich historic, cultural and natural heritage, the region was added to the UNESCO world heritage site. Alps 2 Alps takes an alternative approach to pricing. When booking a trip to Obereggen, we begin with an already-low base-rate and then look to discount the price even further. We consider a variety of factors and provide individual quotations for all of our customers and services. All of the above will only ever result in our base-rate for ski transfers going down – we never over-inflate our prices at any time or for any reason. We also offer substantial discounts for off-peak, off-season and midweek transfers to Obereggen. If looking for the best possible deals, travelling outside peak season or midweek typically results in the biggest savings. We offer midweek (Monday to Friday) prices with up to 60% discount than weekend prices. Obereggen is famed for providing an equally incredible experience for all skill levels across the board. From first-timers to seasoned pros, there’s plenty on offer for everyone. Obereggen is a perfect destination for the whole family. Amenities are first class, the local ski schools are as good as it gets and there’s an air of cosiness about the place in general that makes it truly unmissable as a family ski destination. Alps 2 Alps is about more than just the lowest prices for ski transfers to Obereggen. We’re committed to providing you and your group with the total package of reliability, professionalism and peace of mind from start to finish. To gain access to the lowest possible prices and secure your place on our most popular services, book your Obereggen resort transfers as far in advance as possible. Or if you have any questions about the services we offer, get in touch with the Alps 2 Alps customer care team anytime. With Alps 2 Alps, you’re assured the best possible beginning and end to a Obereggen ski trip you’ll never forget!